In case it needs to be said, Montreal Canadiens forward Max Domi is not a bad player. He’s just not the player the Habs should have acquired for Alex Galchenyuk, and that reasoning isn’t solely based on the argument that Domi is a downgrade on the left side (based on many metrics). 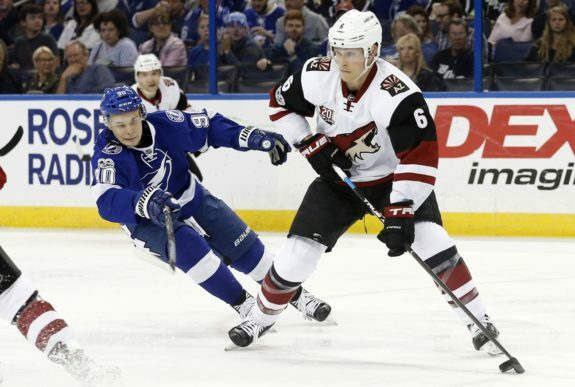 Domi no doubt has upside as a former first-round pick (No. 12 overall in 2013). Even if fans and analysts alike were to dismiss his lack of scoring touch as growing pains though, the above reasoning is actually mainly due to how trading one of the Habs’ biggest chips for him doesn’t help fill the holes at center or on defense. Domi’s obviously not a defenseman. And, based on Canadiens general manager Marc Bergevin’s own admission, he’s not being looked at down the middle, either. So, what gives? Why trade for Domi? Well, assuming Bergevin isn’t a closet Toronto Maple Leafs fan (which would explain a lot of what has transpired over the last few years), there aren’t many good answers out there. 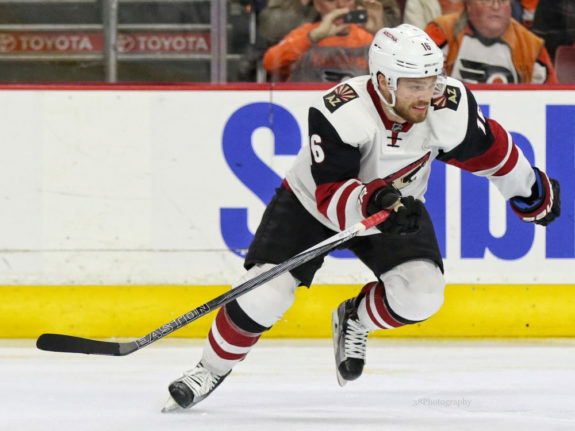 All due respect to the 23-year-old playmaker and all the reported intensity Domi will bring to the Habs, here are five Arizona Coyotes the Habs should have traded for instead, in decreasing order of how much sense each hypothetical deal makes. 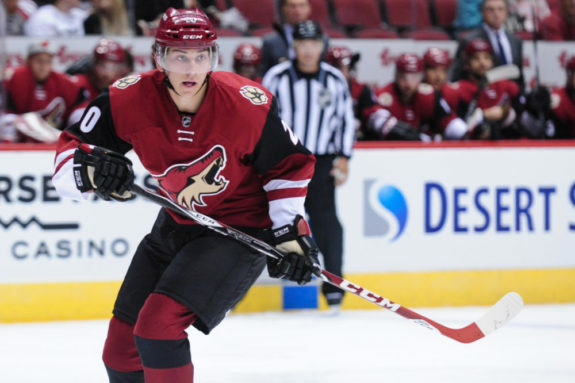 Obviously, Dylan Strome hasn’t lived up to expectations (so far). Drafted as the third-overall selection in 2015, he’s failed to catch on in the NHL. He is a 6’3”, 200-pound center, though. So, trading Galchenyuk, who himself had been drafted at No. 3 overall back in 2012, for him (and maybe another draft pick) might have made for a better trade. Granted, Habs fans would likely be even more up in arms than they already are had they actually gone through with such a deal, considering Strome’s mere 10 career points. At least fans might have been able to better wrap their heads around it, though. After all, the Habs are coming off a 28th-place finish and might be in rebuilding mode. A work in progress like Strome would have been the perfect building block for a team trying to lose now and win later. Meanwhile, Galchenyuk’s relationship with the Habs has been trying at times. Why not try to kill two birds with one stone? To be clear, the argument here (and in all the other points below) isn’t that Strome was made available by the Coyotes during negotiations and Bergevin foolishly turned down the offer. Although, considering Strome’s lack of success at the NHL level, it’s hard to believe he wouldn’t have been. It’s that Strome is one of five different assets still owned by the Coyotes the Habs should have made a play for instead. No one was reportedly putting a gun to Bergevin’s head to trade away his second-leading scorer from last year in Galchenyuk, who has another two years under contract. So, it begs the question: Why go through with the deal at all if you’re not getting what you need? Why not wait for the right offer to come along? 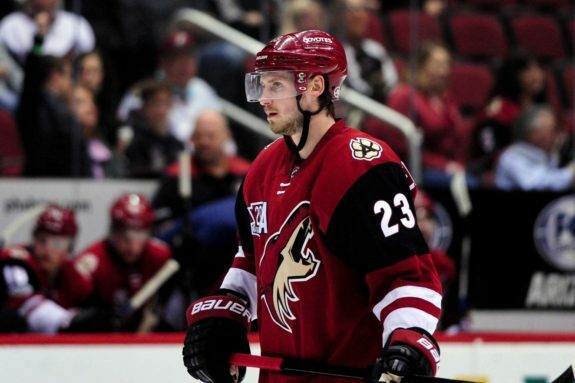 Derek Stepan may not have the upside of Domi or even Strome, if we’re being honest. However, he is an established center, which is more than can be said for Jonathan Drouin, who was arguably forced into the No. 1 pivot position on the Canadiens for lack of another alternative in Bergevin’s eyes. As Stepan is just 28, with a propensity to regularly score 50-plus points, there is no doubt he would have represented a viable return in exchange for Galchenyuk. That he’s under contract for the next three seasons ($6.5 million cap hit) would have counterbalanced the arguable disparity in talent, with Galchenyuk displaying an undeniably higher ceiling. 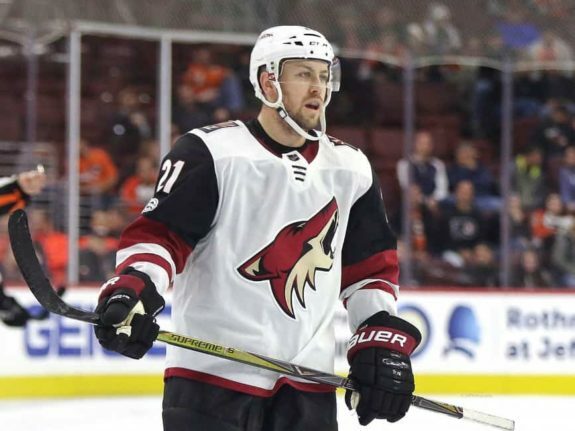 News that Coyotes GM John Chayka sees Galchenyuk as being able to play center might even mean Stepan will slowly be rendered obsolete in the desert. After all, couldn’t you imagine a 6’1”, 207-pound, 24-year-old 30-goal scorer lining up down the middle as your first-line center instead? Bergevin certainly couldn’t. Again, there is no way of knowing whether or not the Coyotes’ first-round pick this year (No. 5 overall) is available or could have been made available for Galchenyuk. It would have made sense for both parties, though. The Coyotes would have gotten a certainty, in a player they know has had success at the NHL level. In exchange, the Habs would have gotten the opportunity to draft twice in the top five, thereby securing the pick they probably should be taking at No. 3 overall in Filip Zadina and the center they probably want at No. 5 in Jesperi Kotkaniemi. Considering Bergevin’s probably going to end up taking Kotkaniemi anyway (according to reports), thereby opening himself up to massive criticism for not taking the best player available, he at least should have enquired about the possibility. Maybe he did and was flatly turned down. What would be worse though: that Bergevin did ask, but “settled” for Domi or that he didn’t even consider it? Food for thought. As a 20-year-old left-handed defenseman who stands 6’2”, 210 pounds, Jakob Chychrun would have checked a lot of boxes for the Canadiens. There’s no denying he’s far from the perfect defenseman, but the 2016 first-rounder displays all-around skill (in all three zones), which is something the Habs swear up and down Galchenyuk didn’t do. Seems like an even trade in theory. For the Habs, it would have done wonders to help repair the mess Bergevin has made of his defense, give Shea Weber someone to play with into the twilight of his career, and help jumpstart the offense, even without Galchenyuk, by infusing some puck-moving ability from the back-end. From the Coyotes’ perspective, losing their first-round pick from two summers ago might be a bit hard to swallow. However, they’re relatively set on the left side on defense (Oliver Ekman Larsson, Kevin Connauton, Alex Goligoski, Niklas Hjalmarsson). And you shouldn’t pass on an in-his-prime former third-overall pick who has played center with success, as long as the asking price is reasonable. If you’re Bergevin, you apparently trade them, though. Admit it, when you first heard that the Canadiens and Coyotes had swung a deal involving Galchenyuk, your heart skipped a beat. You hoped, nay, you realistically thought for that one split second until Domi’s name was revealed that defenseman Ekman-Larsson was coming back the other way. And no one would have blamed you. That’s despite reports Chayka has made it perfectly clear to all other GMs that Ekman-Larsson isn’t available. Reports have even surfaced that he’ll be re-signing come the start of free agency. So, any deal involving Ekman-Larsson is unlikely, even one that would have made as much sense as him for Galchenyuk, one for one. Think about it. If Ekman-Larsson doesn’t re-sign with the Coyotes, they’ll have just one more year of their franchise-cornerstone defenseman. And one year of him for two of Galchenyuk sounds about even. For a team like the Habs, who are probably eyeing a return to the playoffs, there’d be no better pick-up. Ekman-Larsson is a game-breaking, left-handed defenseman, whose mobility and puck-moving complements Weber’s stay-at-home defense to a “T.” Not only would he re-inject life into the defense, but he would also help fans forget about the whole Andrei Markov debacle from last summer. Whereas Markov and Weber forged a legitimate top pairing on defense, Ekman-Larsson and Weber would be unstoppable on paper. In practice though, it just wasn’t meant to be. Obviously, reports indicate in spite of the Coyotes’ lack of a winning culture, they were able to make it work and etch out a contract with their star. That’s in stark contrast to what has just transpired from the Habs’ perspective, where they didn’t even bother to wait until Galchenyuk had a solitary year left on his prison sentence before shopping him, as is what most other general managers would do. Call it mismanagement or short-sightedness, whichever. But the idea that the Habs acquired Domi in exchange for Galchenyuk in a legitimate “hockey trade” doesn’t make any sense. Definitely less than any of the above five scenarios.